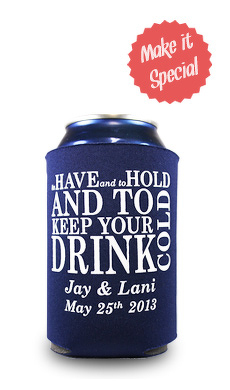 There is no better wedding favor for avid hunters than a personalized wedding camo can koozie! These koozies feature realistic 3-D leaf-like camouflage and collapse down into a foldable format for easy transportation. Not sure what these colors are? We've got swatches below to help you make the proper camo decision for your wedding can koozie! On top of the camo we offer 25 printing colors to tie in with the color of bridesmaids, groom ties or whatever wedding theme you have! These camo wedding can koozies are the perfect gift that will be tagging along in treestands across the country and brining the memories of the big day along with them!